"I have nothing to prove now"
Target Fixation, is so often heard in the crew room, while discussing the fateful encounters of some yesteryear pilots. I also heard for the first time in the crew room of my squadron. It was my second posting, after successfully completing Stage I of MOFT at Tezpur. Bagdogra is a beautiful place with lovely weather and high mountains a little further away. The serene environment promised a fruitful stay for 17 of us in the course. Like most of them, I was also very keen to leave a mark and be recognized as a tough and die hard fighter pilot. I had finished my initial familiarization and almost reached the halfway mark. We were eagerly waiting for the start of the second last phase of our training, a long cherished dream. For a fighter pilot this was the ultimate test of skill. We were to go on a detachment to Kalaikunda for the armament phase after a month but preparation for it was already underway. Everybody was gearing himself up for the time of his life. The pace of flying had suddenly improved, ground studies were given serious attention and we were slowly building up the spirit and 'josh' (enthusiasm) that would be required in the coming month. Finally the day arrived and after a day long shifting and unpacking, we found ourselves settled in the makeshift arrangement at Kalaikunda. In the evening we got a message to be in the bar at any cost so we were. It was a great day with everyone enjoying and making merry. We all knew that from tomorrow it would be a different day. I got up early in the morning, and after a quick wash got ready. We went for the pre-flight briefing, medical and then went to our camp. Very soon I found myself with my instructor flying towards the range for a familiarization sortie.  Our armament raining had three phases. Phase I was ten sorties of guns, Phase II was rocket and Phase II was bombs. I successfully completed my Phase I ad was progressing in Phase II. I was taken for two dual sorties and then launched for my first solo of rocket firing. I had faced some problems in acquiring targets in my first dual sortie and the problem persisted in the second dual as well. The instructor, however, after a long debrief and briefing, told me to go solo and 'just do it'. I said, 'what the heck!'. I will prove that I am no less than the others. I went up, reached the range and after a dummy dive went for live firing. I put my aircraft in the dive and went about adjusting my parameters but couldn't get them right. After a few moments, I left it at that and concentrated outside. I was very rapidly descending to my pull out height and therefore I had to do everything very fast. The moment I thought I had acquired the target, I fired the rocket and pulled up. Gradually my aircraft climbed and I waited for that familiar call on my RT set. 12 O' Clock 100 mts was the call given by the RSO. This was terrible! Awful indeed! I had waited for this moment for so long and the result washed away all my dreams. I tried to make up for the lapse in my subsequent dives but they were no better. Finally with a heavy heart and a long face, I returned back to the base. I couldn't get my sleep that night. Next day also the same thing happened and I couldn't figure out where I had gone wrong. I told my instructor and requested for a dual sortie. However, when it came to solo, it was once again the same thing. 11 O' Clock, 120 mts. Now I was left with my last solo of this stage and I had one last time to prove to people that I could also get direct hits like them. I was a different man that day. Full of determination and a 'never say die' kind of attitude. "Come what may, I will show them that I am also a force to reckon with". Once again, I was over the range and after a brief hold over the circuit pattern, I descended for the dummy dive. I had all the parameters within my control. I pulled out and positioned myself for live firing. On base leg everything was normal. My concentration and focus in place. After careful manoeuvering, I placed myself on the top of the finals, put the aircraft in dive and gently adjusted the pitch to acquire the target in my sight. There it was a white portion encircled by a thick line of white paint. It was the white portion, which was my target today. My focus was intense and my fingers were gently placed on the trigger. Firing range 'fire' and I pulled out safely. I turned downwind for the second dive. "Direct Hit". Did I hear a 'direct hit'? I couldn't believe my ears. I was at the top of the world. I was very excited but quickly regained my composure for the second dive. Everything was fine in this dive, parameters all correct and after firing I pulled out. Direct Hit once again! 'This is a dream'. I had waited for this moment and here in my last sortie, I was doing it. I had one more dive to go and I wanted to bag all three direct hits and create a history of sorts. Everything was similar in this dive, except myself. I was more determined and my ego got the better of me. I put the aircraft in the dive, and checked my parameters carefully. All were within limits. I acquired the target in my sight and gradually moved closer to the target. I felt that this was not enough, so I further corrected for the error. I checked once again that my sight was correctly aligned with the target. It was, but I wasn't satisfied. After all I wont get another chance to get a direct hit. Gradually I saw the target grow bigger and bigger and my sight appeared smaller in comparison. Was this supposed to happen? Well the answer was NO! So why am I not firing? Why am I not pulling out of the dive? Before I could realize what was happening, I heard a shrill panicky voice of the RSO like an Akashvani. "PULL UP, PULL UP". I did pull up and climb away. What I saw from the corner of my eye shook me up and sent shivers down my spine. Trees and RSO hut appeared about 100 m AGL. I had nothing left to prove now. I had proved to everyone what a fool I was. I quietly returned to the base only to come face to face with a visibly angry flight commander who had all guns trained on me. My direct hits in the range were not as direct as the one as I was receiving from my boss. It was a close shave, and it was my ego that would have made me a subject of discussion in the future crew room chats. 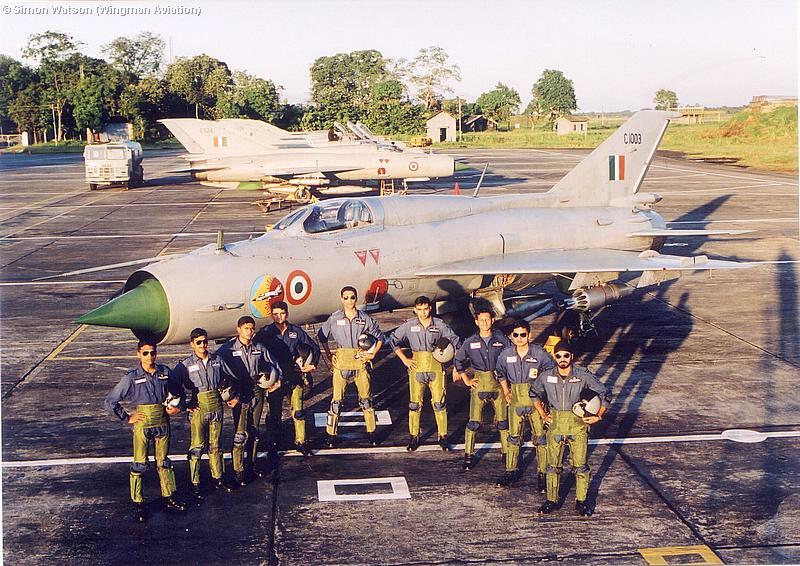 Young pilots of the MiG Operational Flying Training Unit (MOFTU) pose in front their unit's MiG-21FL [C1003]. Note the MOFTU emblem on the nose. 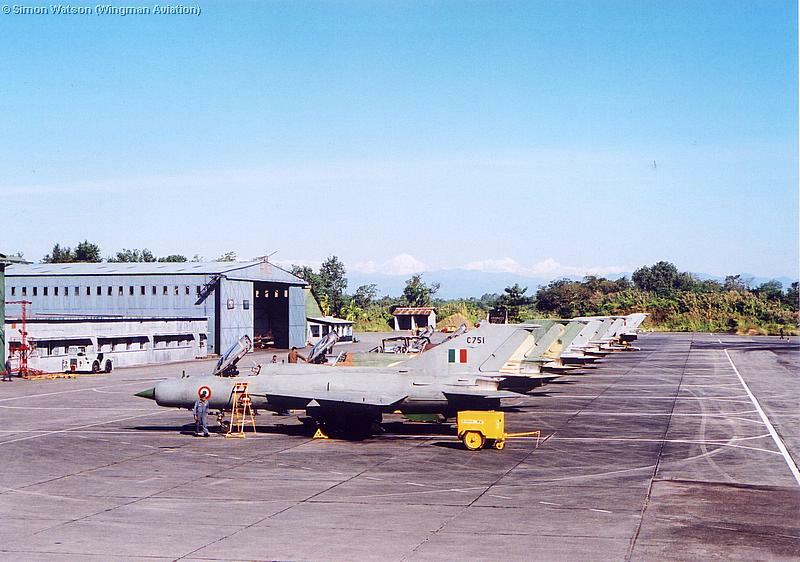 Some MiG-21FLs and trainer variants are seen lined up at Tezpur in this picture. These are MOFTU aircraft and include C751. C743 of the No 8 Squadron. Standing beside it is the C726. 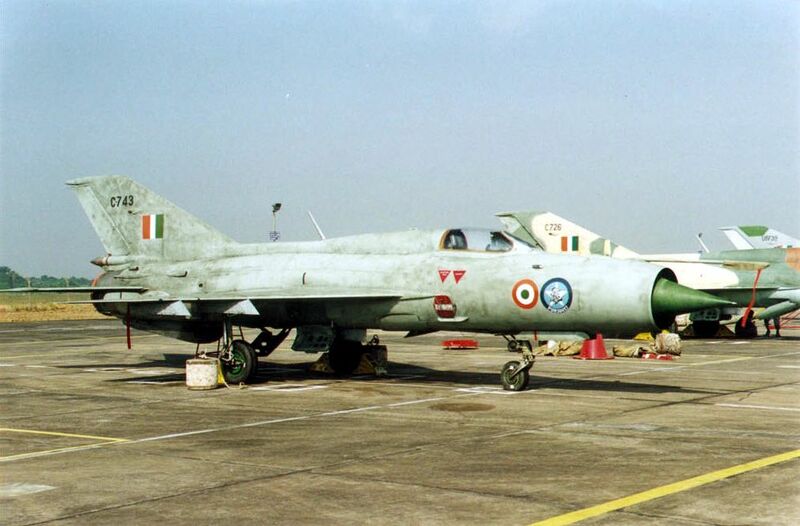 All MiG-21s upto ~C1200 are FL variants. Identification features include frameless canopy and a 'thin' back. Mounted in the centreline is a single droptank while 57 mm rocket pods are mounted on the inner wing pylon. These machines originally featured just one harpoint per wing, but since then they have been locally modified resulting in a total of four pylons. 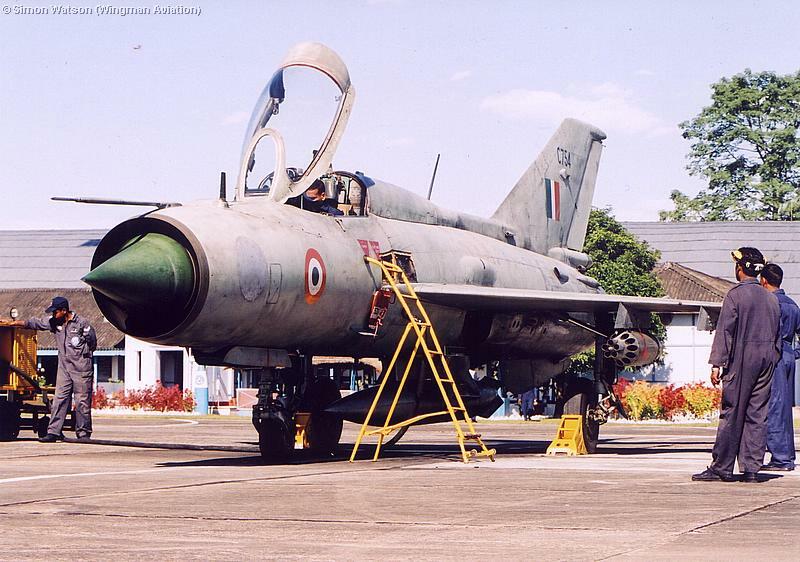 Being one of the earlier generation MiG-21s, the FL variant, like the C989 in the picture, lacks an internal machine gun. This serious deficiency is overcome with a gun pod, albeit at the cost of a hardpoint. The GP-9 gun pack, clearly visible here, features a 23 mm gascha gun. 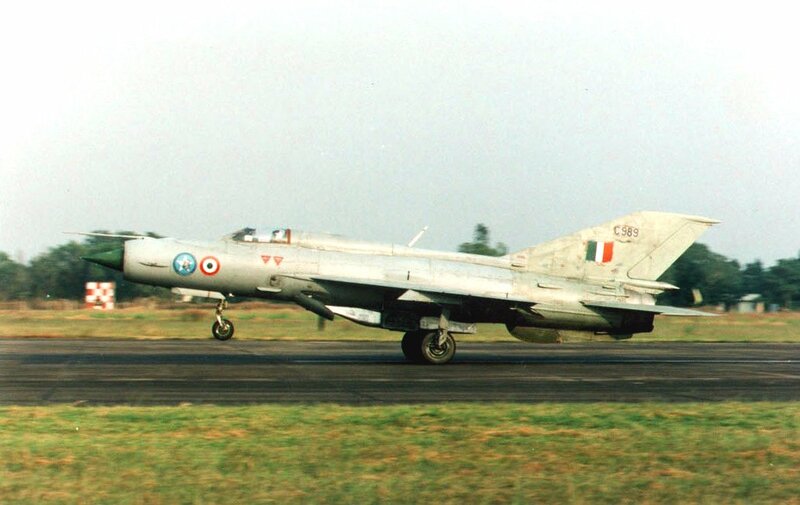 bharat-rakshak.com/IAF/Images/Special/Tezpur/: Aviation journalists Phil Camp and Simon Watson discuss the IAF's MOFT syllabus. Plenty of good pictures. 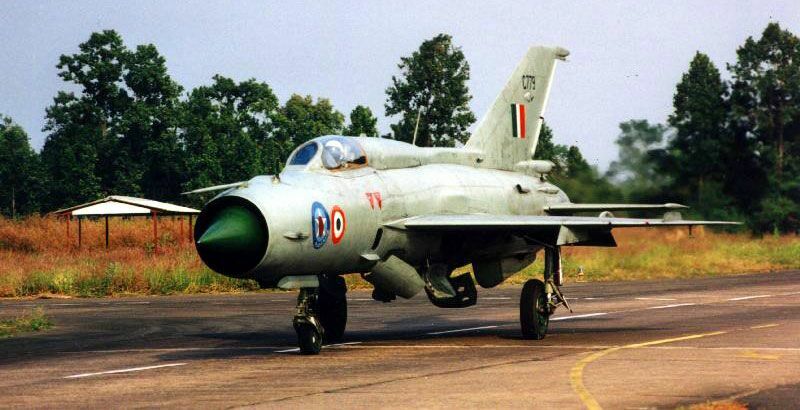 indianairforce.nic.in/airforce/30sqn.htm: A writeup on the No. 30 Sqn Rhinos at the Official IAF Website.